It’s that time of year when the poppies which have self-seeded all around the garden start to flower and they look so lovely (even if they drive Gail a bit mad in the vegetable garden!!). We let them flower each year and then remove most of them, leaving a few to go to seed. 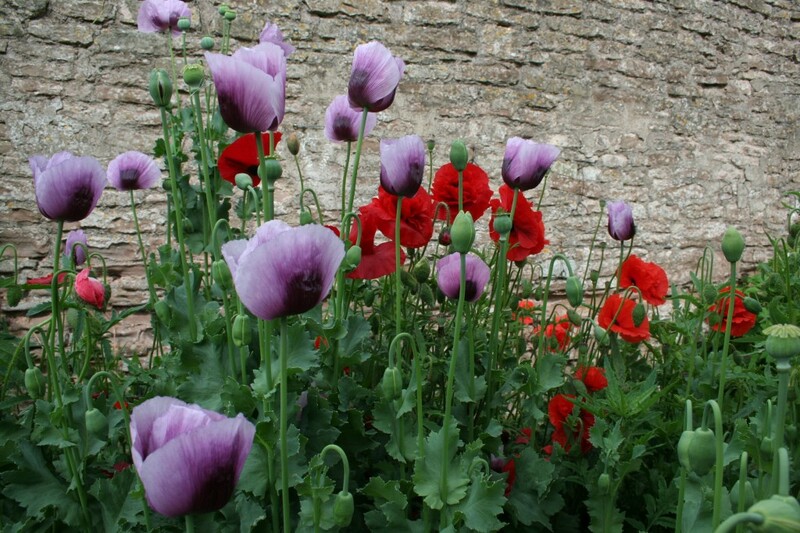 They freely interbreed so we’re getting some wonderful new shades of purple and pink this year. 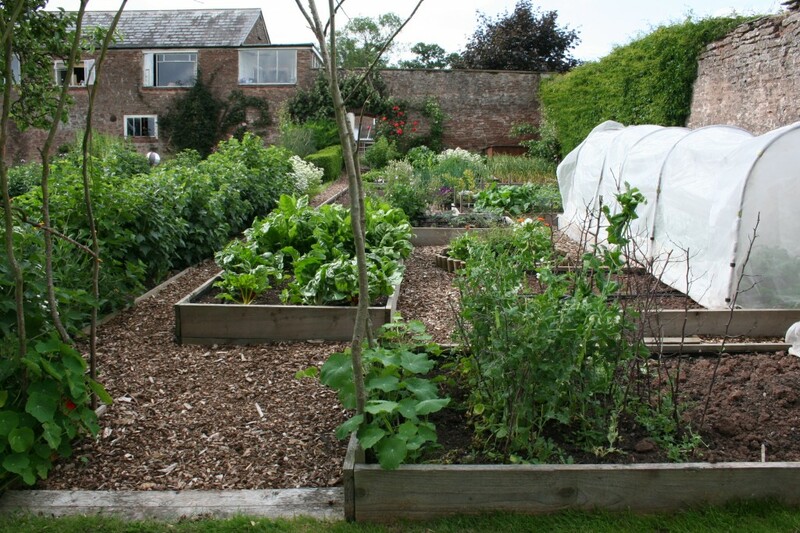 The veg garden is pretty much there in terms of planting out and sowing. As June got busier with groups and quick changeovers between them, Mel needed to turn her attention back indoors and Gail has been continuing to get everything ready. Our home-made micro tunnels are now up protecting the brassicas and salad greens from the prolific cabbage white caterpillar and other munchers. We ate the first of the new potatoes today at lunchtime – such a delicious taste straight from the ground, adorned with nothing but a little bit of salty butter. Even if you only have a small back yard, we highly recommend just growing a couple of potato plants in a large tub. Very different to anything you might encounter in the supermarket. The weather’s good today so Mel is washing blankets. Only another 20 to go!!! Gail’s continuing to spend time adjusting any recipes we have which are over-generous and tend to lead to wastage. We recently heard horrific statistics about the amount of food that’s thrown away every day in Britain. For example, according to the Love Food Hate Waste campaign, every day in Britain we throw away 1.3 million yoghurts and yoghurt drinks, 7 million slices of bread, 5.1 million potatoes, 1.6 million bananas, 4.4 million apples and 2.8 million tomatoes. We’re reading the excellent Book of Rubbish Ideas by Tracy Smith (http://www.bookofrubbishideas.co.uk/) and have been further spurred on to make sure we are not wasting food unnecessarily. 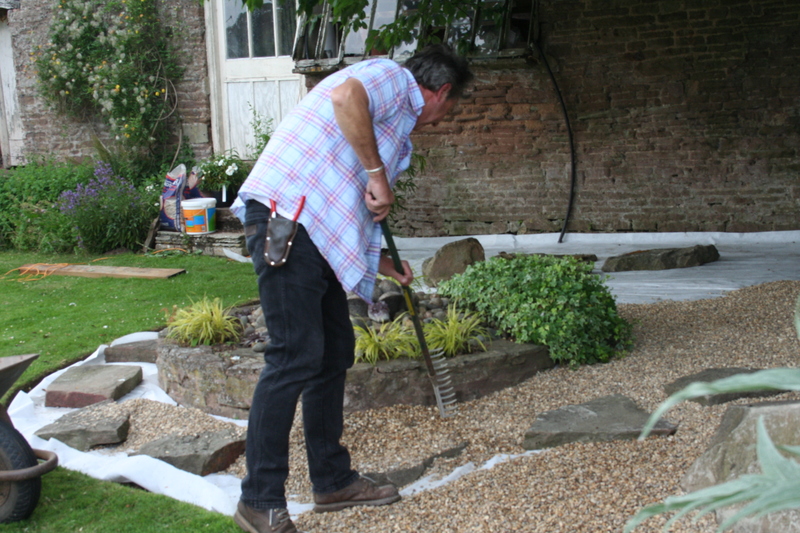 Steve and (the camera-shy) Dave have been putting down the foundations of the new stone garden under the cherry tree by the potting shed. 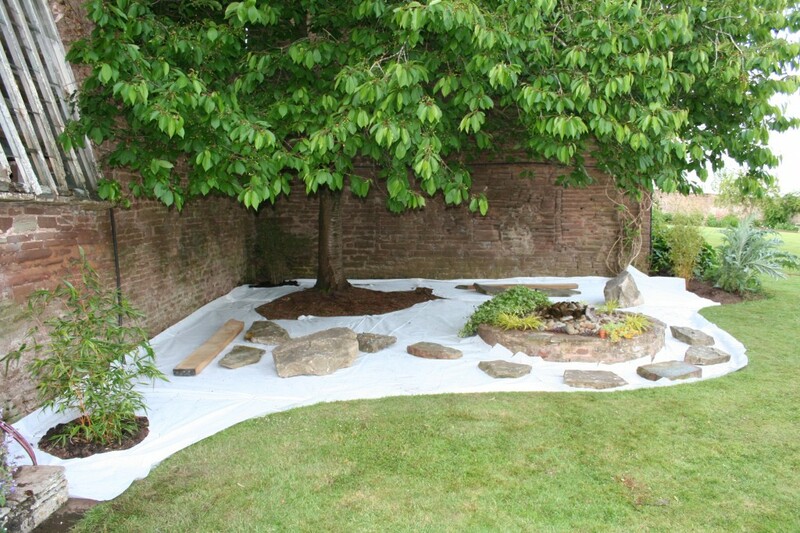 Influenced by Japanese Zen gardens, the area features some beautiful old lichen covered stone which Steve managed to find and grasses and bamboos whose movement and sound in the breeze should be pleasantly relaxing. Eventually we’ll be adding two wooden seats so it can be used for small group work as well as just sitting, listening to the bamboos and the fountain. Since last writing, we have had Christian Pankhurst’s lively Accelerated Awakening group (http://www.christianpankhurst.com), a Heart Essence meditation silent retreat with Burgs (http://theartofmeditation.org/) and we are now getting ready to welcome Bristol College of Massage and Bodywork (http://bristolmassage.co.uk/) for the residential part of their basic foundation course. Perhaps we’d better stop blogging and get on with something!! !